This is the info page for Woody Mann’s students at Berklee College of Music. Students: Please email for class schedule and private lessons with Woody. Country blues is an essential part of America’s musical history. It is an art form encompassing a wide variety of sounds styles and techniques – from gospel, blues and folk melodies to ragtime and early jazz syncopations. The instrumental, vocal and songwriting techniques, as well as their approaches to improvisation were central to the development of America’s roots music and early jazz styles. This class is listening history of pre-war blues through the recordings of the major artists including Charlie Patton, Robert Johnson, Blind Lemon Jefferson, Scrapper Blackwell, Memphis Minnie and Blind Blake as well as the obscure (but no less great) masters such as Blind Joe Reynolds, Buddy Boy Hawkins, Clifford Gibson and Willie Walker. The styles range from the blues of the Mississippi Delta to the ragtime sounds of the Carolinas. The class offers a history of African American musical traditions as well as the development of the early recording industry. Come and enjoy a listening survey of one of the richest traditions in American roots music. The Country Blues Guitar workshop focuses on developing fingerstyle technique and learning the repertoire of the early masters including Skip James, Blind Blake, Big Bill Broonzy, Robert Johnson, Memphis Minnie, Reverend Gary Davis, Lonnie Johnson and many others. The workshop will cover techniques including syncopated picking, chord melody, playing in open tunings, improvisation, and the connection to other styles including ragtime, folk, and jazz. This is a workshop for students who would like to expand their fingersyle playing and explore new sounds while learning some great tunes. Working as a group, the focus in on performing in a relaxed non-competitive atmosphere and develop individual performance skills as well as a common repertoire. The set-list includes a wide range of sounds from the country blues and roots masters including Robert Johnson, Scrapper Blackwell, Charlie Patton, Big Bill Broonzy and many others. This is a playing workshop for learning new tunes and developing improvisational skills as a soloist and as a group. Open to all instrumentalists. Here are a few suggestions of classic tunes and melodies. Country blues is an essential part of America’s musical history. It is an art form that transcends its original times, offering a lasting body of material, techniques, and approaches to improvisation. Though its heyday in the 1920’s and 30’s is a distant memory for most musicians today, time has not diminished the musical contribution of the early masters. The instrumental, vocal and songwriting techniques, as well as their approaches to improvisation were central to the development of America’s roots music as well as the early jazz styles. 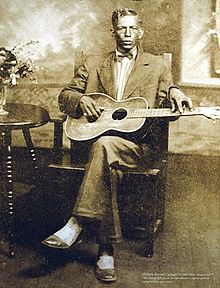 Historically, country blues traditions developed from the collective work of individual musicians. In the 1920’s, itinerant musicians traveled throughout the South and mid-west playing on street corners, at local dances, and in churches. Their music was a confluence of sounds from African chants to the pop music of the day to Appalachian and English folk ballads. There was no one geographic center where musicians would meet. As a result, each artist developed his or her own sound, repertoire and technique. In addition, jobs were scarce and highly competitive, encouraging little collaboration among musicians. The result was a genre rich in sounds and approaches defined by the individuality of the artists. Country blues is often overlooked as a type of music that existed in a contained time and space that no longer resonates with contemporary aesthetics. But the instrumental and songwriting techniques as well as the approaches to improvisation are central to the development of America’s roots music. It represents the beginnings of the jazz story and pre-cursor to the early styles of King Oliver, Louis Armstrong, Bix Biderbeck and the musicians who recorded in New Orleans in the late 1920s. Though it’s initial audience is gone, it is a genre that should not just be acknowledged but expanded. The following list of 80 titles was compiled for 4CD set of country blues recordings I put together for Acoustic Music Records, in Germany: “The Essential Country Blues Guitar” – Acoustic Music Records (319.2004.2). It features the most important (and most recorded) artists as well as the obscure (but no less great) players who cut only a few sides. To me it represents the some of the most creative guitar arrangements and showcases a broad cross-section of styles from across the South. Here is the complete track listing for each of the volumes. Here are a few suggestions for blues anthologies and individual artist CD’s.